Are Your Customers Stuffed With Fintech Apps? Summary: Despite the rising popularity of finance apps, most people who use them have concerns about data privacy. How to educate your customers on the privacy risks. You are probably still stuffed from your Thanksgiving fun yesterday and we are too. 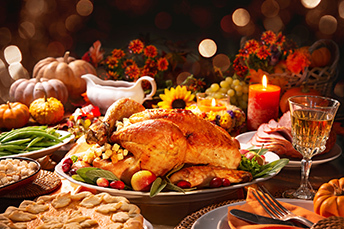 Here are some interesting facts about the holiday: 57% of people celebrated at home; 64% ate mashed potatoes; the most expensive item on the table was the turkey. As you gnaw on that leftover turkey leg, know that in the banking world, about 33% of Americans now rely on mobile and online fintech applications to manage their money. This includes everything from making payments, to applying for loans or even investing for retirement. Yet, despite the rising popularity of money management apps, the majority of people who use them have concerns about data privacy. They fear that using such apps could be putting their personal information at risk. According to a survey by The Clearing House, 89% of people who rely on online and mobile apps to manage their money admit that they have at least some concerns about data privacy, while 67% are very concerned about their personal information. Even more interesting is the fact that the majority of consumers who routinely use fintech apps believe that they control whether or not their information can be shared with third parties. Furthermore, when people find out that they have actually authorized access to their information by agreeing to the usage terms and conditions of many apps, 47% of fintech users say this revelation makes them less likely to use such services. In the wake of a seemingly endless stream of high profile data breaches, consumers are understandably more concerned than ever, when it comes to the security of information. While most consumers say they are okay with information regarding their investments and historical activity being shared, approximately 60% have concerns about the idea of personally identifiable information being shared with fintech apps. This is particularly true for passwords, bank account user names, Social Security numbers and biometric information. In fact, 56% would like the ability to determine exactly what information can be accessed by third parties, with permission dashboards through their banks to grant such permission. As with all things tech related, age is a major factor in the way consumers view data privacy. According to the study's findings, fintech users over 45Ys old are less likely to know how long their data is accessible to third parties, whereas younger consumers tend to think their data is only accessible while they are actually using an app. Where consumers seem to be in agreement is in their belief that banks are and should be the safeguards of their information. 51% of fintech users say banks should look out for their privacy, while only 35% of consumers believe the onus should be on fintechs to safeguard their information. For community banks, the findings of this study highlight the importance of showing customers that your bank has their best interests at heart and is making every effort to protect their personal information. You may even want to teach them how fintech apps are already using their information. Doing so can help keep customers from falling asleep around their privacy and security - even after binging on the table of app offerings served up every day by fintechs. An ABA survey finds the age groups that used mobile apps to make a payment or transfer money within the past 12 months were: 18-34Ys (44%); 35-44Ys (34%); 45-64Ys (20%) and 65+Ys (14%). Online lender Social Finance Inc. (SoFi) lost money for a second consecutive quarter in Q3, as loan volume declined and the company spent money on expansion. SoFi's primary business is refinancing student loans. Chinese banks have begun using advanced smartphone technology that uses facial expressions to detect whether a user is lying. Western banks as of yet are hesitant to use the technology amid regulatory concerns over ethics and reliability. The Fed has released proposed rules that would ease Dodd-Frank regulations for banks $100B to $250B in assets. The press is calling these "smaller banks" but we will let you be the judge of that one.